Syncee can read a file from a Dropbox URL. 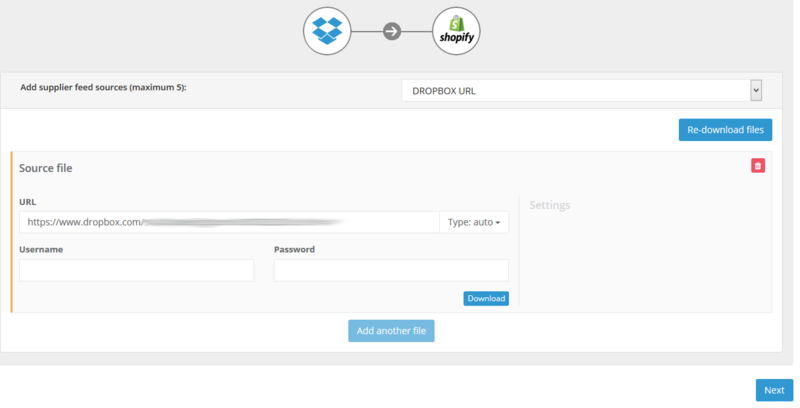 Start a product import task and select in the "Add file" step the "DROPBOX URL" option. You can add it to our app and download the file. Set your file "Settings". Don't forget to click the "Done" button to save them and that's it. Now you can go to the next step. In this source type, Syncee saves the path of the file you selected and next time it will automatically use it. Important NOTE: If you are the owner who creates this Dropbox file, not your supplier, you have to click in Dropbox on the Share button and choose the "Create a link" button. Here is your Dropbox URL. If you have a question feel free to write us.